No two Chevy owners are quite alike – although they all share one important trait in their choice to drive a Chevy. But beyond a great taste in trucks, Chevy owners each have their own needs and uses for their particular truck, and Chevy knows it. That’s why all Chevy trucks have been built for decades with some of the best architecture, the best materials, and the finest craftsmanship in the auto industry. Chevy trucks are built to take whatever you may throw at them, and they have been for years. Those who choose to shop for used Chevy trucks may have their own unique needs, and Chevy makes each truck ready and able to handle just about anything. Whether you’re in the market for a mud-ripping off-roader, a reliable and stylish everyday pickup, or something that can do everything and then some, there’s a used Chevy truck waiting out there for you – all you need to do is know what to look for. Here’s a look at the three main ways Chevy truck drivers use all that class and power. Take a look and figure out which one you’re looking for – and then get out there and get behind the wheel. Sometimes, roads just aren’t enough to rein in your love of dirt-destroying truck power. For these times, only a Chevy Truck will do – especially if you’re behind the wheel of a 2015 Chevy Silverado 2500HD LTZ. Built to take on the toughest trail you may come across, the 2015 Silverado 2500HD LTZ is perhaps the finest in a long line of refinements to make this Chevy truck one of the toughest off-roaders out there. Decked out with either the legendary Duramax 6.6L V-8 turbo diesel engine, this near tractor-trailer like driving experience produces 380 horsepower and a whopping 765 lb-ft of max torque power. That equals out to a maximum conventional trailering weight of 13,000 pounds and a Gross Combined Vehicle Weight of 24,500 pounds, and this Chevy features an exhaust braking system with the diesel engine to help control the truck’s fully-loaded speed while descending a hill. Plus, the 2015 Silverado 2500HD LTZ boasts a 7.2 second 0-60 mph time, and Rancho shocks with LTZ suspension make crossing chasms and taking on rocky trails no biggie, no matter where you may find yourself. Plus, this 2015 model features a whole host of advanced Chevy options to make your ride comfortable and convenient, including a touch-screen navigation system, Bose audio, an EZ-Lift tailgate, and a snow-plow prep package. Whatever adventure you may have ahead, this is one Chevy that can stay with you every step of the way. Finding a truly efficient pickup can be tough, and even more so when browsing used options. Until only recently, horsepower ruled the truck market, with efficiency and fuel economy coming mainly second. But if any automaker was on top of the efficient engine trend in the best pickups on the market, it was Chevy – and that’s evident in the 2010 Chevy Colorado Crew Cab. Built to be a reliable pickup option that’s as well-rounded as it is convenient, the 2010 Colorado brought impressive fuel economy to a respectable power level for truck lovers who simply can’t settle for less than the most efficient options out there. This trucks packs a standard 2.9-liter inline 4-cylinder engine, capable of 185 horsepower and 190 lb-ft of torque, all while maintaining an amazing 18 mpg city / 25 mpg highway fuel economy at 2WD and 17/23 mpg at AWD. But as reliably efficient as the standard engine option may be, this 2012 Colorado still packs plenty of power without draining the tank. Those looking for a bit more oomph should choose the available 5.3-liter V8 engine, capable of an impressive 300 horsepower and 320 lb-ft of torque all while keeping a 14/20 mpg 2WD and 14/19 mpg AWD fuel economy. That’s plenty of power without having to spend a fortune on fuel – and Chevy drivers have come to expect no less when piloting that perfect used Chevy truck. Off-road, on-road, and all around town – sometimes, you just need a truck that can do anything. 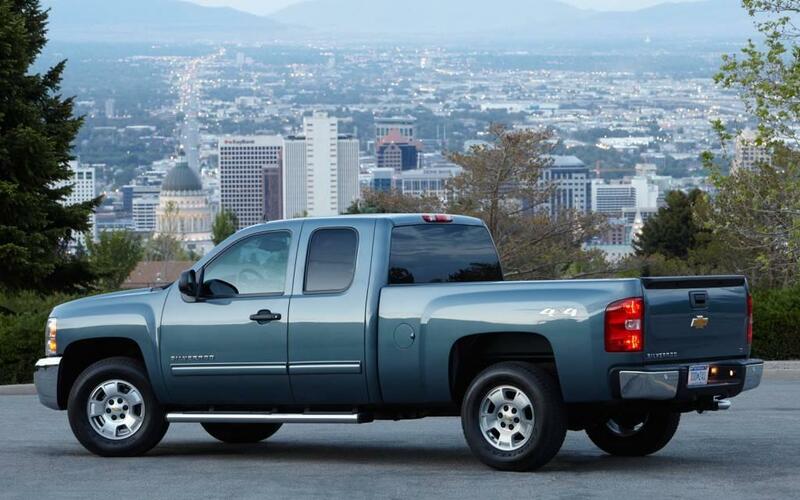 For these drivers, few used trucks can compare to the 2014 Chevy Silverado 1500. Built to be the everyman’s pickup, ready to handle just about any task you may put in front of it, the 2014 Silverado is built to be anything you need it to be. Packing serious and efficient power and a fully fleshed-out interior, the 2014 Silverado is a versatile truck for the ages – and just one test drive can show you why. This edition Silverado comes standard with a scrappy 4.3-liter V6 Flex-Fuel 2WD engine, capable of 285 horsepower and 305 lb-ft of torque, all while maintaining an 18/24 mpg fuel economy. Those looking for a bit more work-ready power can try the 5.3 liter V8 Flex-Fuel, boasting 355 horsepower and 383 lb-ft of torque with an impressive 16/23 mpg 2WD and 16/22 4WD fuel economy. For serious off-road ready power, there’s nothing quite like the 6.2 Liter V8 Flex-Fuel with 420 horsepower and 463 lb-ft of torque, all on top of a 14/20 mpg AWD fuel-economy. No matter what you may have in store for your Chevy, there’s a used Chevy truck out there that’s perfect for you. That’s why off-roaders, daily commuters, and hard workers alike all trust Chevy trucks to get the job done day in and day out, without missing a beat. Check out some of the fine used Chevy truck options available at your local used Chevy dealer, and see for yourself just what this classic lineup has in store for you. Chances are, you’ll find something that makes all those adventures ahead not only possible, but as fun and exciting as possible.